We presented a webinar for the Wine Communicators of Australia called Wine Labels: How to sell from the shelf. Read our perspective on why your wine label is so important. 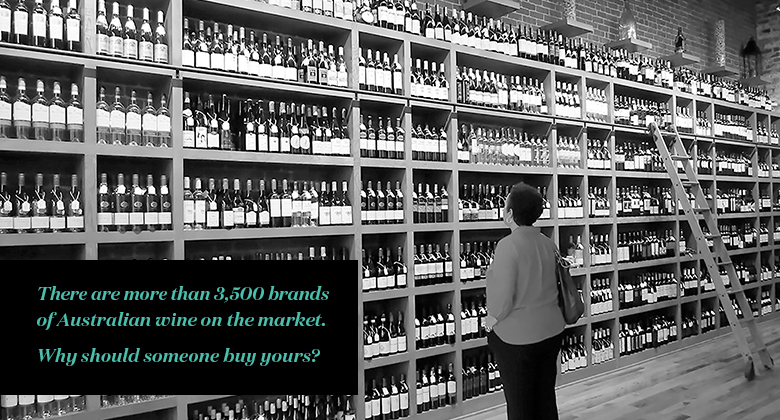 There are more than 3,500 brands of Australian wine on the market. The key question is: why should someone buy yours? If your answer to this question is the quality of your wine, or your 5 star James Halliday rating, you need to think again. In a flooded market like wine, the quality of your product is no longer a sustainable point of difference; but merely a condition of entry. “Simply putting high quality, affordable wine onto retail shelves does not guarantee sales. Consumers must choose to take it off the shelves and keep choosing it in the face of an increasing number of enticing, well-marketed options”. — Wine Australia Directions to 2025. Which wine should I buy? Will I look savvy or foolish if I take it to a dinner party? What does it say about me by association? Your wine label is often all that consumers have to go on in a busy liquor store environment. This is why we refer to your wine label as your silent salesman. It has to work hard to stand out on the shelf and send the right messages to the right people in order to convince them to buy your wine over that of your competitors. If you want to sell more wine from the shelf you will need more than just a pretty looking label. You need to start by building a strong brand with a radical point of difference. When we talk about brand we are not talking about your logo or wine label. What we are actually talking about is perception. That is, your brand is what other people perceive about your company and the products and services that you sell. When enough people arrive at a similar perception you can be said to have a strong brand. A radically differentiated brand is about owning a unique perception in the mind of the consumer. This is important, as we are hard wired to notice what is different. As your wine label is often the first (and arguably the most important) touch point that the consumer will interact with, it has a huge influence on how your brand is perceived. A good doctor won’t prescribe treatment without first understanding the problem. The same goes for a good designer. It is important to understand what consumers really think about your brand, any issues or challenges that your brand faces in the market, and what opportunities exist for radical differentiation before beginning any creative work. – How are you different? – Why should people care? This plan is then used as a guide to develop and manage your brand moving forward. It may be tempting to skip the research and strategy stages in a misguided effort to save time or money, but without these insights and a strategic plan you are flying blind and risk making unnecessary or ineffective changes to your product packaging that are a waste of money, and potentially damaging to your brand. The creative stage is where the rubber meets the road, so-to-speak. Good strategy can be let down by poor creative, and vice versa. The creative stage is all about solving identified problems by dressing your brand in appropriate clothing to communicate the right messages to the right target customers. When we talk about sending messages, we are really talking about semiotics, which is the study of signs and symbols, and how they are used to create meaning. Each component of your wine packaging is a sign or symbol that conveys meaning to a potential customer and so every little detail needs to be considered when designing product packaging. This includes the shape and weight of the bottle, the closure, the texture of the label stock, the print finishes, the typography, imagery and colour palette, and even the tone of the copywriting on the back label. The production stage is all about bringing the strategy and creativity to life, and achieving the optimum balance between brand communication and cost. Just as good strategy can be let down by poor creative, and vice versa, both strategy and creativity can be let down by poor production. This could be from not investing the appropriate amount to send the right messages to the right people, or it could be more of a technical issue, like bubbling, that impacts the final product. This is where your relationship with your designer and printer becomes important. The whole supply chain from the bottle manufacturer, the paper manufacturer, the designer, the printer, and the bottling line share responsibility for producing the final product for the shelf. It is imperative that they work together not only to mitigate any production risks, but also to deliver the best quality product within budget. The moral of the story is that your wine labels are just as important as the quality of your wine, if not more so. You must invest equally in both, or you risk being left behind on the liquor store shelf. Please click here to view this presentation on SlideShare. © 2019 Studio Lost & Found.